Death Metal. A genre that will never succumb to any form of censorship, to any watering down, a genre that has a bountiful supply of budding Metal bands truly reinventing the wheel. However sometimes, there are bands that didn’t intend on doing it so well but just have the knack to write absolutely ferocious Death Metal. 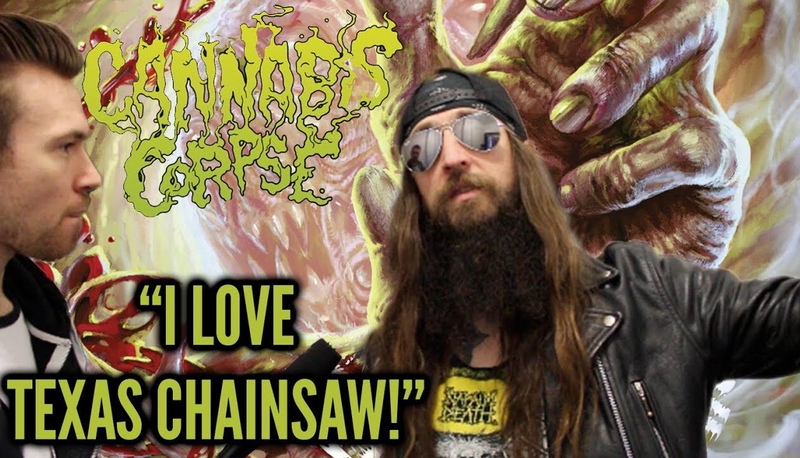 Cannabis Corpse are just that! Having released their latest record Left Hand Pass back in 2017, the band have been busy carving their name into the world of Death Metal. Aside from the initial marijuana themed moniker the band adopt, once you get down to it this band have been writing some of the premiere Death Metal in recent times. Touring all over Europe, the band broke their 5 year streak of absence by performing at London’s Black Heart this March and it was, to coin a phrase, dope. Shortly before their show, I was able to ask lead singer LandPhil some questions that ever since I had discovered Beneath Grow Light’s Thou Shalt Rise, had been pestering me, including that From Wisdom To Baked album cover that really seemed like a nod to the Sawyers from The Texas Chainsaw Massacre folklore. Make sure to subscribe to my YouTube channel if you enjoyed it! Cannabis Corpse’s brand new album Left Hand Pass is out now, Happy 420!